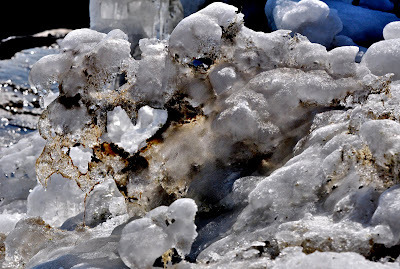 Time, dirt, sand, and, now, rising temperatures have created some odd little ice sculptures along the lakefront. (This almost doesn't look like ice anymore.) This little lopsided heart was formed - briefly - near Fullerton Avenue. By the time I walked back to this area, about fifteen minutes later, the front section had collapsed. What Will They Build Now?